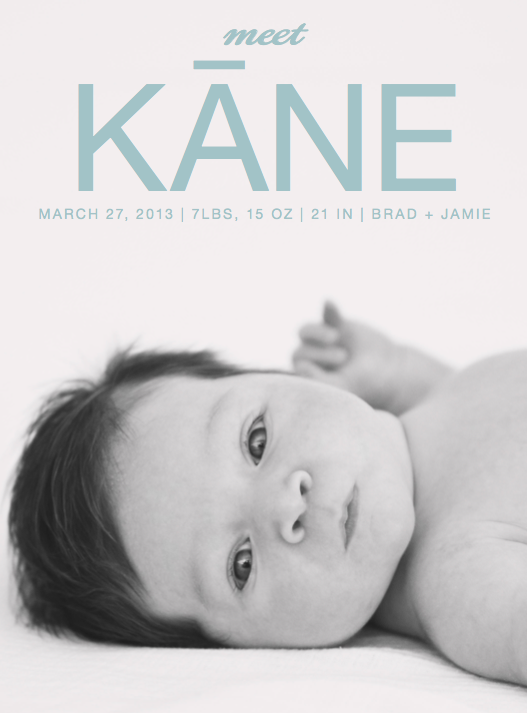 Intertwyned: Kāne Charles Simon is Here! Kāne Charles Simon is Here! On March 27, 2013 at 7:35PM, after 39 1/2 hours of labor (yes, you read that right - 39 1/2 HOURS! ), our sweet baby boy was born! Kāne, (pronounced "Kah-Nay" and means "Man" in Hawaiian) is just over 7 weeks old now and is lifting his head, enjoying tummy time, smiling back at mom & dad, tracking objects with his eyes, and even starting to giggle! Life has seriously never been better! While I am on maternity leave, please feel free to email me and, if interested in seeing more of Kāne & our life's little moments, follow me on Instagram and/or Facebook! Thank you to All for your love & good wishes! Thank you, sweet Catherine! Our days are filled with so much joy because of this little man! And we even got a 5 hour stretch of sleep last night! Woo hoo!! Thank you for stopping by and your good wishes! I so appreciate the love! If the mother sees her child, it makes her complete for sure. I guess, Kane also loves the camera. He already knows how to connect!